Pope Benedict XVI - Just Tell Me Why | Dichotomies, debates and opinions. Pope Benedict XVI (born Joseph Alois Ratzinger on 16 April 1927) is the 265th and current Pope, the head of the Catholic Church and, as such, Sovereign of the Vatican City State. He was elected on 19 April 2005 in a papal conclave. He succeeded John Paul II. 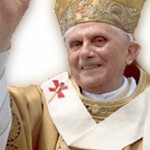 Do you like Pope Benedict XVI? He represents a radical conservative agenda that is a hazard to the moral health of the entire human race.